Few brands have as loyal a following as gaming outfit Razer, whose devotees crave new product announcements from the firm's enigmatic CEO, Min-Liang Tan. 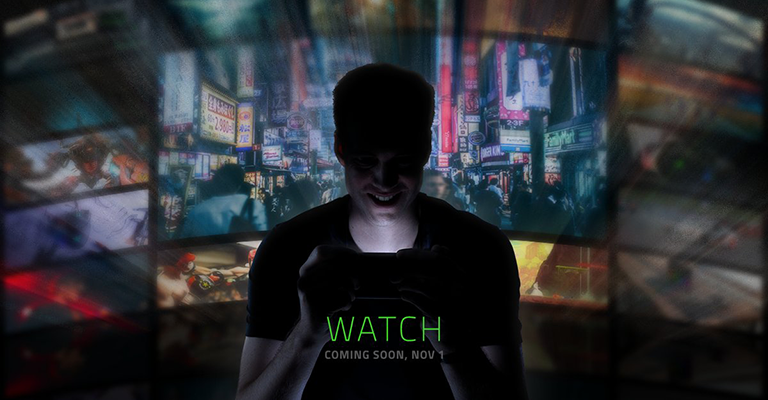 There's good news for such folk, as Razer has hinted at a major unveiling on November 1st. Widely expected to be the introduction of the company's first smartphone, the announcement has been teased on Twitter as Razer's "biggest unveiling" alongside an image of a man presumably holding the fabled device. There's little to go on, though the graphics in the background do hint at a gaming and multimedia focus. A Razer smartphone has been on the cards for some time, with the rumours gathering pace following the firm's acquisition of Nextbit earlier this year. A growing list of theories in the Razer forum has fans wondering whether or not the new announcement could involve a watch, tablet or other device, but a smartphone seems most likely, particularly after Min-Liang Tan was pictured with a suitably sized device protruding from his pocket earlier this month. All signs suggest the smartphone will be an eye-catching proposition with the bright-green Razer logo emblazoned on the back, and we're intrigued to see whether or not the firm's gaming background can help produce a powerful handheld that's a little different to the norm. We'll find out in just under three weeks. Wonder if it'll be as gaudy as most gaming peripherals or more businesslike. Bets on the former.. Depends who they've got on board. Additionally you have to remember that there are quite a few brands out there whom are stable and profitable, not just those three giants. I doubt this is just going to be a phone, I presume this will also be some form of dockable portable gaming device. “bright-green Razer logo emblazoned on the back” Errrr yeah, hopefully they will have some colour options. Not sure thats going to sell it for them.